James Rocco recently announced that at the end of 2017 he'll be stepping down from his position at the Ordway, which he's held for over ten years, to pursue other career options. I don't see another Broadway Songbook on the Ordway's schedule for this fall, so I'm wondering if this is the last one. I certainly hope not, and if we're lucky James will return to the Ordway once or twice a year to continue the series*. He has an obvious affection for the genre of musical theater and is such a wonderful host - warm, funny, nerdy (in the best way), and casual, as if we're all in his living room chatting about theater. But not just chatting, also watching performances by some of the top musical theater talent in the Twin Cities, this time in the form of Dieter Bierbrauer (truly one of my favorite voices in #TCTheater), Erin Schwab (proving once again there's nothing she can't do in terms of music, comedy, theater, and performance), Kersten Rodau (with a powerhouse voice), and Yolande Bruce (ranging from saucy to sweet). They're backed by a super cool five-piece band led by Raymond Berg on piano. 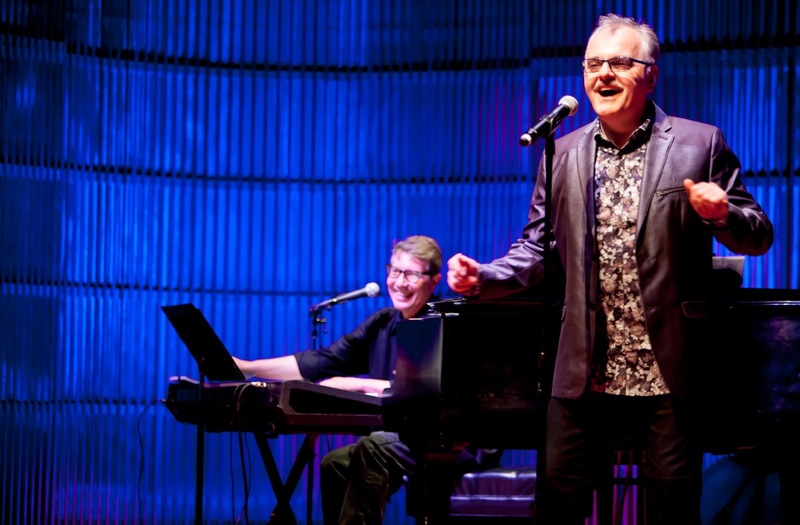 The show begins with classic songs from the early days of Hollywood. I had an interesting intermission discussion with my fellow bloggers. Some of them did not appreciate the new arrangements of the songs, which were sort of smooth jazz "coffee shop" renditions. But I thought the arrangements were kinda groovy. Just know that if you're a person who likes traditional songs to sound traditional, some of the arrangements might make you angry. Or maybe, like me, you'll think it's fresh and interesting to hear these familiar songs ("Blue Skies," "Over the Rainbow," "Lullaby of Broadway") sound like you've never heard them sound before. As we walked through a brief history of film, we were treated to songs from early movie musicals. Then we moved on to Broadway musicals that were turned into movies, some of which had new songs written for them. Act II began with the resurgence of the original movie musical via Disney, beginning with The Little Mermaid (a super cool version of "Kiss The Girl" with Dieter as a '50s crooner and the women as back-up singers) and Beauty and the Beast (a lovely rendition of the title song by Kersten), the latter eventually becoming Disney's first movie-to-musical adaptation, which opened the floodgates for many more of the kind (for better or worse). I was thrilled at the inclusion of Xanadu!, which lovingly spoofs the movie musical, although I wish Dieter had joined Kersten on the song since they both starred in the Chanhassen's awesome production a few years ago. And of course James took a moment to promote An American in Paris, a recent movie-to-musical featuring the songs of the Gershwin brothers, on tour at the Ordway next month. After traveling nearly 90 years through history in a brief two hours, we came full circle from the first original movie musical, 1927's The Jazz Singer, to the newest original movie musical, La La Land (which can be seen at Orchestra Hall this fall, with the MN Orchestra playing the yummy score). It wouldn't be a Broadway Songbook if I didn't quibble about song selection. And yes, I would have loved to hear some Once, arguably one of the most successful recent movie-to-musical adaptations with eight Tony Awards. But that's the beautiful thing about musical theater - we all have different shows and songs that are special to us. And with a net so widely cast as movies-to-musicals and musicals-to-movies, everyone's going to notice different omissions. 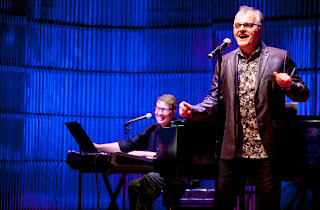 But all in all this Broadway Songbook is, like the other twelve I've seen, a wonderfully entertaining, laid back, informational, fun evening of musical theater. And hopefully not the last one. 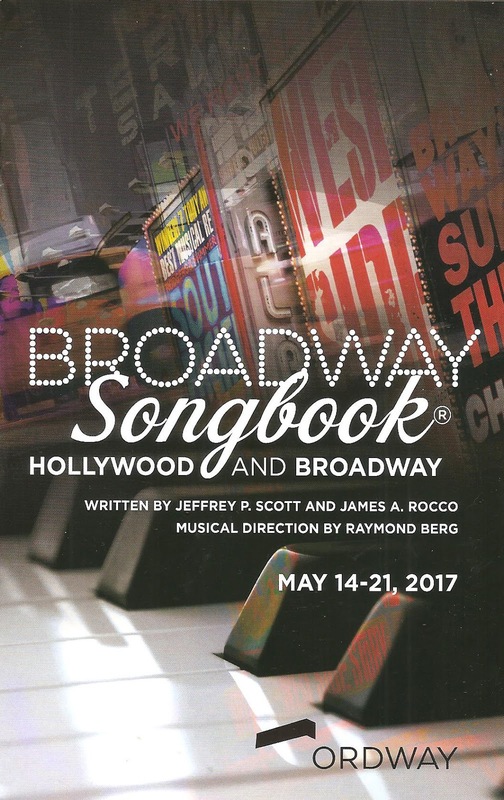 Broadway Songbook: Hollywood and Broadway has only two remaining performances - tonight and tomorrow afternoon, with tickets still available for both shows. *I have been assured that the Broadway Songbook series will continue regardless of James Rocco's employment at the Ordway. Visit their website for details on upcoming shows.